Would you rather rent a conventional storage unit or a portable shipping container in Clinton UT? Well if you want to save time, money and headaches, then you should definitely go with the latter. 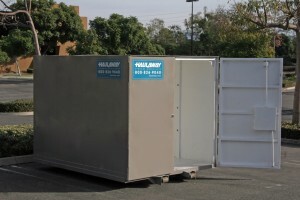 Haulaway Storage Containers, Inc. got started back in 1968. Since then we have experienced tremendous growth because people realize that portable storage is easier, faster and cheaper than traditional storage units. Care to hear why? First of all, when you have a storage container delivered directly to your home or business, it’s a complete game changer. It saves you countless trips driving back and forth from a fixed unit. It’s like having built your very own storage unit right onsite. We can deliver a shipping container to most any Clinton UT property, and we’re quick about it, too. We can usually have your container dropped off within one business day of you calling. You’re free to use your new storage for a few days or for an entire season. When you’re through, we will promptly swing back by to pick it up. No hassle or fuss on your end. Because our containers are far cheaper to manufacture than an entire storage building, we are able to pass those savings onto you. So you’re not only saving time and energy, you’re saving money as well. We have a variety of containers to choose from. They range from 10’ to 40’ in length. They are all wind and water-resistant and all come standard with high security locking systems. If you require a stronger storage container, then our 20’ and 40’ models will suit you best. They have thick, 14 gauge steel walls and are protected by our patented Rhino Locking System. Our range of container sizes and strengths are sure to provide you with the perfect storage solution for you specific project requirements. Haulaway Storage Containers is ready to show you that renting a shipping container in Clinton UT is the smartest way to tackle your storage needs. Call us today or go online to receive your free quote. We are happy to answer any questions you may have.